We had another great summer fly fishing season and would like to thank everyone that joined us last summer in Alaska! We are taking reservations for our 2019 summer season and invite you, your friends and family to join us at Reel Action Alaska Lodge to fly fish the famous Kanektok River (aka The Chosen River) next summer! We have a high repeat booking rate so please check availability early as many of our guests come back annually to experience our world class fly fishing operation. We run a fly fishing tent lodge right on the banks of the Kanektok River and offer one of the most diverse and best value fly fishing vacations in Alaska. Our staff is also great and well trained at hosting large groups of friends, coworkers or families at our lodge. In our 17th year in business, Reel Action Fly Fishing is one of the premier outfitters managing fly fishing operations in both Western New York and Southwestern Alaska. We understand the importance of having a highly trained and experienced team of guides, staff, and managers that assures your experience is the best. Guests enjoy a 1:1 guest to staff ratio with a focus on excellent customer service and attention to detail. We would be happy to refer you to guests that have fished with us on any of the weeks you like. If you would like to download our 2019 Reel Action Alaska Lodge Brochure please click here. Our standard week long package to fly fish the Kanektok River runs from Friday to Friday with a full 6 days fishing and 7 nights of lodging. Our guests can also take advantage of fly fishing in the evenings at our river front access on one of the best gravel bars in the lower river! In the month of June our weeks are priced from $5,250 to $5,950 to kick off our very popular prime salmon and rainbow trout season. Our July week long prices range from $5,150 to $5,750 per person and have some of the best variety of fish species Alaska has to offer. Also on our last two weeks of July we have family week specials where adults pay full price and siblings 21yrs or younger accompanied by an adult pay half price! August weeks are $5,500 per person and are the most popular weeks with an amazing run of fresh chrome bright silver salmon! For a listing of prices per week and the fish species available please scroll down. We also have a limited number of 3 day / 3 night packages for June, July, and August that range from $2,850 to $3,250 per person, please contact us for dates. Your all inclusive package also includes transportation from Quinhagak to the lodge by jet boat, all lodging (your own private heated tent cabin with bed and linens), meals, rods, reels, custom tied flies by our guides, terminal tackle, vacuum packing of fish, fish box, a USB drive of pictures and videos from your trip plus free wi-fi and phone service. Please feel free to call, email or text us! All Inclusive Packages - Includes transportation from Quinhagak to the lodge by jet boat, all lodging (your own private heated tent cabin with bed and linens), meals, rods, reels, custom tied flies by our guides, terminal tackle, vacuum packing of fish, fish box, a USB drive of pictures and videos from your trip plus free wi-fi and phone service. Our standard package is a week long Friday to Friday 6 day / 7 night. To fill a handful of remaining openings in the 2019 summer season we are offering several different lengths of stay on some of our summer weeks. Please note these rates are only available for the summer 2019. Please email us at info@reelactionfly.com or text or call us at 585-568-7335 (REEL) to check on availability. Prime swinging for king salmon week or fly fishing for rainbow trout. Mousing for rainbows and dry fly fishing for grayling. Prime swinging for king salmon week. Chum salmon, sockeye salmon, pink salmon all available. Mousing for dolly varden and rainbow trout. Dry fly fishing for grayling. Prime swinging for king salmon week. Chum salmon, sockeye salmon, pink salmon all available. Mousing for dolly varden and leopard rainbow trout. Dry fly fishing for grayling. Prime swinging for chum salmon week. King salmon, sockeye salmon, pink salmon all available. Mousing for dolly varden and leopard rainbow trout. Dry fly fishing for grayling. Grand slam week with all species available including king salmon, early silver salmon, chum salmon, sockeye salmon, pink salmon. Mousing for dolly varden and leopard rainbow trout. Dry fly fishing for grayling. Prime diversity week with king salmon (first part of week only), chum salmon, sockeye salmon, pink salmon and silver salmon possible. Mousing for dolly varden and leopard rainbow trout. 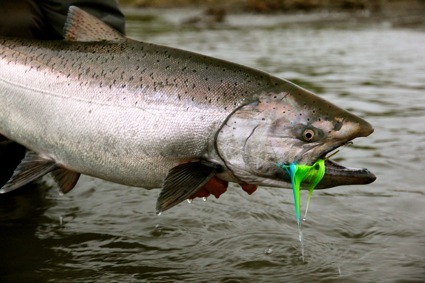 Egg patterns also highly effective as this is a major egg drop week for spawning salmon. Dry fly fishing for grayling. Prime diversity week with chum salmon, silver salmon, sockeye salmon and pink salmon. Mousing for dolly varden and leopard rainbow trout. Dry fly fishing for grayling. Prime silver salmon week. Mousing for dolly varden and leopard rainbow trout. Flesh flies and leech patterns are also highly effective this week for rainbows. Dry fly fishing for grayling. Prime silver salmon week. Mousing for dolly varden and leopard rainbow trout. 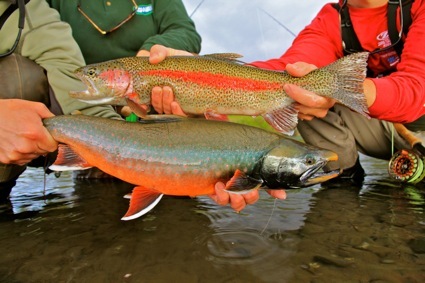 Flesh flies and leech pattern are also highly effective this week for rainbows. Dry fly fishing for grayling. Season: Our 2019 summer season will start on June 14th and run through August 30th, 2019. Lodge Capacity: We can accommodate 10 to 12 guests per week and hire a staff of 10 to 12 which ensures you have the best individual attention along with excellent customer service. Our small size allows us to have a flexible fishing program. Single Person Accommodations: All guests get their own fully furnished tent cabin complete with comfortable bedding for no additional charge. Single anglers do not pay extra, period! Togiak Refuge Permit: We have a Special Use Permit allowing us special access into the Togiak National Wildlife Refuge Wilderness Area. Riverfront Fishing Access: We have excellent riverfront access that guests can walk too from camp and has some of the best king, silver, and chum holding water on the river. Highest Quality and Variety: The Kanektok River is one of the best rivers in the world for having a huge variety of beautiful, aggressive fish, combined with a huge variety of fly fishing water (main river, small stream channels, gravel bars, spey/swinging water, drift boat water). Over five hundred thousand fish run past our lodge during the season. Excellent Mousing: The river has some of the best mousing for rainbow trout and dollies in Alaska. We have even caught silvers, chums, pinks, sockeye, and grayling on mouse patterns! Guide Ratio: Two guests to one guide with your own jet boat. Our guides are courteous and respectful of the fishery, knowledgeable in their craft, patient, and excellent instructors. Rotation Of Guides: Guests go out with a different guide daily and are able to experience different techniques and locations on the river. Our guests often comment on how much they learn with having a different guide each day. Lodge Equipment: We have Winston, Sage, G-Loomis, Redington, and Echo fly rods. 10wts, 9wts, 8wts, 7wts, 6wts both spey, switch, and single hand rod/reel outfits are all accessible for your use. Custom Fly Patterns: All our guides tie their own flies and have special fly patterns that are highly effective on the Kanektok River. Rest assured your guides will be prepared so you have the best trip possible. Pictures: At the end of your week our guides assemble all the pictures from their cameras and you will go home with flash drive filled with all the images from your trip. Guests often comment what a great service it is to go home with such amazing pictures! Easy and Affordable Travel: Flights to our lodge are easy and affordable with rates ranging between $360 to $611 round trip. Family, Friends, and Fun: Our family friendly environment makes this a great trip for couples, families, and friends. Our guides are excellent instructors and are great at teaching beginners how to cast a fly rod and catch fish! Trip Details: Your all inclusive trip package also includes transportation from Quinhagak to the lodge by jet boat, all lodging, meals, rods, reels, custom flies, terminal tackle, vacuum packing of fish, fish box and a DVD of pictures and videos from your trip. Booking Terms: A 50% deposit is due at the time of booking to hold your week. We will hold your week for 10 business days after booking, until the deposit has been received. Our prime weeks fill up very quickly and availability is subject to first come first serve. Final payment of the remaining 50% is due 120 days prior to your trip. We strongly recommend travel insurance for unforeseen circumstances.